Three cheers for mathematical superiority! 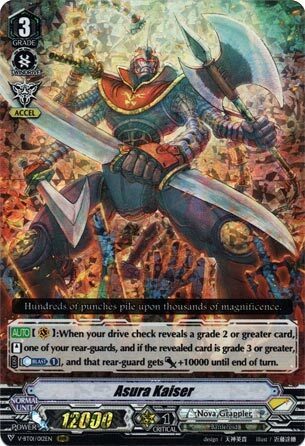 So new Asura Kaiser can Stand a rear-guard when a Grade 2 or above is checked, not just a Grade 3, but if you DO score a Grade 3, it gains a power bonus for a cost. Well, it’s mathematically superior in ONE respect, but it still has problems, and that problem is Front Triggers. I mean, 8 Crit, 4 Draw 4 Heals exist if that’s the lineup you want, but for those who want Front Triggers for whatever the hell reason, be aware that should you ride this you’re going to get RNG screwed eventually no matter what you do with it. If you attack with Asura first to get the most out of a Front Trigger, and you score a G2 or above, you’ve wasted a Stand and thus screwed yourself out of another attack. If you attack with something first before Asura and yet fail to score a re-stand then your Front Trigger, should you score one, is going to have its usefulness cut by a third. So Asura is of course never going to be the priority ride over Perfect Raizer, who can Stand without needing to rely on chance and can if lucky recoup losses back itself. Or alternatively just don’t run Front Triggers. I mean Criticals scored early get the damage you want in without any additional attacking on your part.